Jesus said some challenging words in the Sermon on the Mount, found in our New Testament in Matthew chapters 5, 6, and 7. Today I’d like you to take a few moments to find and read Matthew 5:38-48. Do that, if you would, before reading the rest of this article. There is something counter-cultural about the way Jesus calls us to live. In the first-century world, the relatively young Roman Empire controlled Palestine, the area in which Jesus lived and ministered. Jews such as Jesus could have been forced to assist Roman soldiers in carrying supplies and materials for certain distances. Walking “the second mile” thus became something counter-cultural, almost revolutionary: it broke down the difference in power between a Jew and a Roman. In the first-century world, if someone slapped you (with his right hand) on your right cheek, this was a power-building maneuver: the aggressor states his dominance over you with this action. Turning the other cheek (to receive another slap), as Jesus instructs, leaves the aggressor with an uncomfortable choice. Either he must use his left hand, which was considered unclean, or he must use his right hand again – but this time using the front of his hand, not the back of his hand, to strike your left cheek. Slapping with the front of the hand was understood as a challenge between equals; you might expect the aggressor to say “I challenge you to a duel!” at this point. Again, this is counter-cultural, almost revolutionary: Jesus tears down expectations of power-based relationships between people. One year ago, a teenage girl stood up for the right of girls like her to receive an education. As a result, in October 2012 she was targeted by aggressors who wished to silence her message by eliminating the messenger. She and several others were shot, many of them killed, but she survived the gunshot wounds to her face. This girl spent the next year recovering and continuing to speak out against the injustices in her world. She became so well-known and beloved for her positions supporting justice and peace that she was nominated for the Nobel Peace Prize this year. Her name? 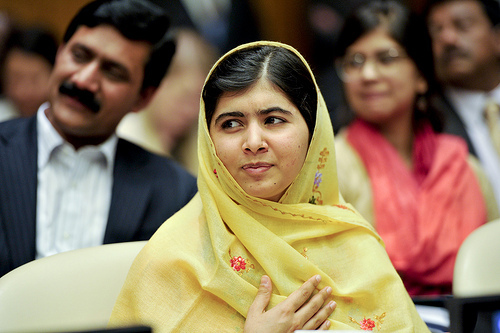 Malala Yousafzai, a sixteen-year-old Pakistani girl. Malala Yousafzai is a practicing Muslim. Jesus is seen as a prophet within Islam, and in many ways I see Malala’s words above echoing Jesus’s thoughts from the Sermon on the Mount. What she said is counter-cultural, both in Pakistan and in the western world. Her stance toward her aggressors breaks down power dynamics and asserts the ultimate value that each person in the world has in God’s eyes. What if we were to pursue peace as strongly in our own lives? What if we loved and prayed for our enemies? What if this is what it means to be “perfect” or “complete” or “mature,” as Jesus commanded us to be, in imitation of our heavenly Father?